What should you do to prevent hair loss? Have you given any thought to hair loss? Sure, we might be young and have a full head of hair now. But fast forward to your late 20s and luscious locks suddenly become a hot commodity. What’s a lad to do? Luckily there are a few things you can do to help prevent hair loss. First, you need to know that our everyday activities could probably be leading to hair loss. The good news is that you can combat this. Here’s what we have learned. What leads to hair loss? After surveying 200 dermatologists (via a Dove Men+Care survey), 92% of them agree that physical stress and environmental factors can lead to hair loss. Physical stress can be anything from aggressive combing, over combing, or the pulling of hair (whether it be from a kid or during a wild Friday night). Dermatologists agree that we are all living a more active and stressful lifestyle than previous generations. This leads us to not make the healthiest food choices and, after time, this can affect the quality of our hair, in addition to adding on a few extra pounds. Do you know what type of shampoo to use? There are several types of shampoos that can be used on a daily basis. 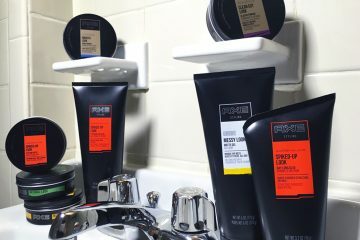 Moisturizing shampoos, 2-in-1 Shampoo & Conditioners, anti-dandruff medicated shampoos, Thickening shampoos, and simple men’s shampoo make up the lot. Each shampoo has their own unique purpose but do you know which is best to prevent hair loss? Ultimately, dermatologists agree that choosing the right shampoo and hair care products, along with a proper diet, is the best route to help prevent hair fall. Over half of the surveyed dermatologists agree that using a men’s moisturizing shampoo like Dove Men + Care is a step in maintaining stronger, more resilient hair. Paired with a healthy diet, your hair can be strong enough to hold up to our active lifestyles. Next ArticleDry skin? Try showering smarter.